So you haven’t started your Christmas Shopping? 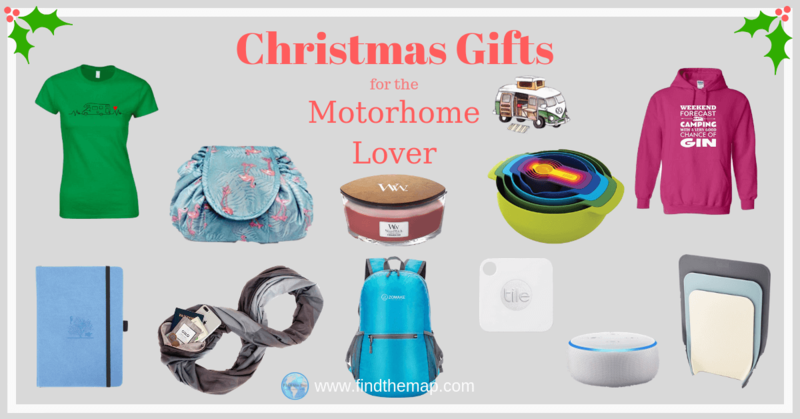 You need to start NOW otherwise you’ll miss out on that Perfect gift for the Motorhome Lover in your life? 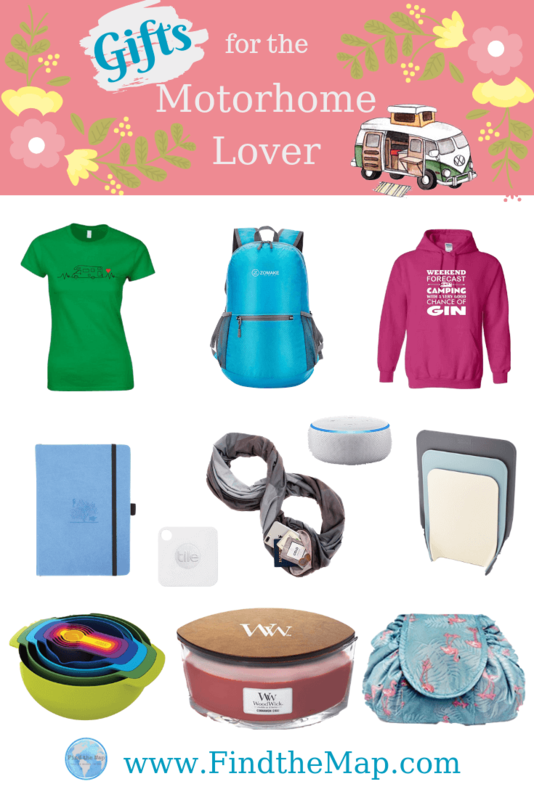 These are the top selling, most loved and treasured gifts for the Female Motorhome Enthusiasts under £50. Whether its’ a Christmas present, birthday present or any other special occasion, here are some gifts not to be missed. Every Motorhomer will enjoy a nice glass of wine (or gin) whilst listening to the crackle of this candle. The sound of a warm burning fire without an actual fireplace. An excellent gift for the Glamper Camper. Whether free camping of staying at a camp site with wifi, this little gem is the perfect gift for the Motorhome. Use as a portable speaker or stream music over wifi on site. Its small and compact and can be run off an inverter. Do you know someone who loves Camping and Gin? I sure do! This is the perfect Glamping Gift. A gift that can travel to the end of the earth and on every adventure with them. Choose a colour to match their personality. We all know that Space is a premium in a Motorhome, so this little set is a practical Perfect Gift for your Motorhome Enthusiast. It fits comfortably into a drawer and contains 2 x mixing bowls (large and small), a sieve, colander and measuring cup set. This basket is super convenient. Fold it flat and store it away until its needed. Can be used to carry dishes, do the grocery shopping, laundry basket, the list goes on and on. A must have item for any Motorhomer. ‘Genuine Adventurer – Endless Journey’ The Name says it all. Motorhomers love the adventure! The perfect shopping tote for an outing into town or just doing the grocery shopping. Variety of Colours and Quotes to choose from. Every passionate Motorhomer needs ‘The’ Motorhome T-Shirt proclaiming their love of the lifestyle. It’s the ultimate accessory for the Motorhome Ms.
Super practical for the motorhome owner, these little storage containers and lids, stack inside each other. Colour codes for use with different food groups. A great space saving idea. A funny gift idea to get a giggle. Hide away the precious jewels and cash. No one would think to look in a soup can. A great little Practical gift for the lady Motorhome enthusiast. Practical and easy to store. These nested chopping boards are another tiny kitchen item that makes cooking a breeze in the motorhome. An ideal gift for the Motorhome enthusiast that loves to prepare home cooked meals. This fancy design allows you to open the umbrella from the inside out, very handy when your trying to get out of the Motorhome in heavy rain. No more water running off the umbrella onto the floor of the Motorhome with this umbrella. Finding a safe place for all your little tiny precious jewellery items can be tricky in a Motorhome. Keep all your favourite go to pieces in the one place in this compact jewellery roll. 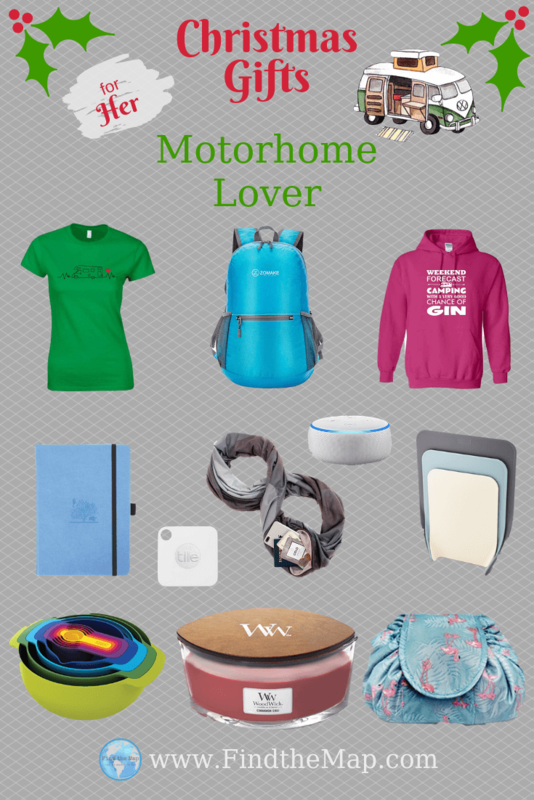 An item for the Glamping Motorhome Lover that she wont be able to leave home without. This handy little item Protects your phone where ever you are. Dust, Drop and Snow proof. Every adventurous spirit needs a little help protecting their device every now and again. The Motorhomer that likes to explore abroad will love this scarf with hidden pocket for their valuables. No need to wear a backpack on your front. Keep your precious items in this scarfs hidden pocket. For the Motorhoming Ms that likes to travel to foreign countries. Easy to store and compact, this lightweight day pack is the perfect choice for a day out in a new city or hiking in the mountains. A Motorhome must have. Getting washing dry quickly is a top priority to Motorhomers. These towels dry super fast and pack up to a small roll for storage. A great accessory to any campervan. Never loose those mobile home keys again with this handy tile. Attach it to the keys and you will be able to locate them using your phone. Lost your phone? no problem, use the tile to locate your phone. The Motorhome enthusiast needs a handy pouch to take all those bits into and out of campground showers. Water proof and lightweight for the adventurer on the go. Looking for Motorhome Accessories to make that next trip hassle free? Making memories is the essence of travelling, so it fits that every Motorhome lover should have a Journal to record all their day to day experiences. A great choice for removing excess moisture off the Motorhome windows. 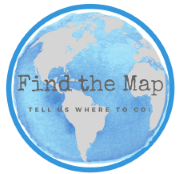 Quick and easy to use so you can get on your way to the next destination. So there are my top ideas for the Female Motorhome Enthusiasts. Do you have your own favourite Motorhome or Travel Accessory? Let me know in the comments below. 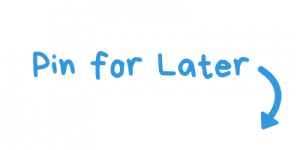 This post may contain affiliate links, which means I earn a commission (at no extra cost to you) if you purchase something using our link. By doing so you help us improve the free content on this website. Thank you! Great list! I especially like the kitchen products that are compact and not made of breakable material! I have a good friend that could use some of this. Thanks for sharing! Thanks Justine, I really like the stacking bowls. We are a family of 5 and so space in our motorhome is a premium. Everything needs to pack up small or lie flat. These stackables are so practical. I love your choices! I really need the scarf and the key finder! Hi Melanie, I thought about using the key finder for my kids when we are out and about in crowds. I could just attach it to a wrist band and my youngest would be trackable. Such a handy little tile, so many uses. I love all of them! 😍 But I especially like the travel jewelery roll and the travel scarf. So cute! Hi Ilaria, thanks, I especially like the scarf too, so handy for all kinds of travel.